Guru’s Guide TCalifornia Lowball is a form of poker in which the strength of cards is reversed, It’s also known as Ace-To-Five Lowball and it’s an increasingly popular poker variant. For players used to basic ‘high’ poker rankings, playing a game of this genre takes a bit of getting used to and it’s perhaps a good idea to take in some practice hands before wagering real money. The aim of California Lowball is to create the strongest five card hand according to Lowball rules; that is a hand with no pairs and one which contains a high card lower than your opponents highest card. Straights and flushes do not count against you and Aces are low (unlike in Baduci). This is a game played with blinds to get the betting going and so the player s to the left of dealer place the small and big lines. 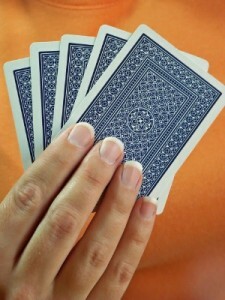 Assuming that at least two players still remain in the game, each player can discard and replace one or more of their cards. This is the only drawing round so it’s unlikely that players would replace more than one card – you clearly won’t have much of a hand if you have to replace multiple cards. A further round of betting now follows after which any remaining players reveal their cards in the showdown. The winner is decided according to Lowball rankings which you can read about here. A joker is used occasionally in this game and when you are lucky enough to have one in your hand it will substitute for the lowest ranked card not already present.